Have you ever heard of a Therapy Schnauzer? 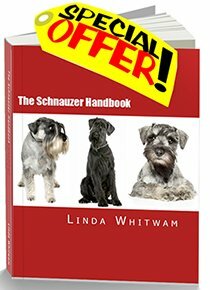 Did you know that Schnauzers are particularly suitably as therapy dogs? Therapy dogs are in fact dogs which provide affection and comfort to people in environments such as hospitals, retirement homes, nursing homes and schools. They can also help people with learning difficulties, terminal illnesses or those in stressful situations, such as disaster zones. Therapy dogs come in all shapes, sizes and breeds. The most important characteristic is temperament. They must be friendly, patient, confident, at ease in all situations and gentle with people. 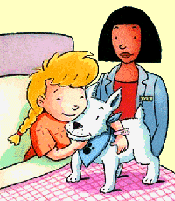 Therapy dogs must enjoy human contact and be content to be petted and handled, even clumsily sometimes. Schnauzers are very human-orientated dogs. Put simply, they LOVE being with people. They enjoy the companionship of their owners and family and thrive on being the centre of attention. Most of them are happy to sit and be patted all day long! And it is this characteristic and their sociability which makes Schnauzers so suitable as therapy dogs. Testament to the Schnauzer as a therapy dog comes from a wonderful account sent to us by one of our readers, Rae from Florida. She sent us this heartwarming - if sad - story of her Miniature Schnauzer Skippy. "Hi Max, I have a story for you. I am 39-years-old, and disabled. I cannot drive or work, so my days become pretty lonely when our 10-year-old son is at school and my husband is at work for over 12 hours a day. Our lives were blessed with "Skippy," a Miniature Schnauzer, because he came into my life at a hard time when I was diagnosed with a rare blood clotting disorder and seizures. Skippy was not only my companion, he was my best friend and a member of our family. I bought him Christmas presents, Valentine's presents and often presents just for being Skippy! He was faithfully always by my side, through sickness and health. I can not describe to you just how much happiness and love that he brought into our lives, into my life. I have a terminal illness and he helped me more than once to remain positive and happy. I can only pray that he knew how much he was and is loved. On the morning of March 2, 2009, he had went outside to potty, as usual. He had never suffered with any health problems. When he came into the house, he fell to the floor and I knew something was wrong, I knew. He was not "normal" all day and evening. I phoned every Vet that I could and they all told me the same advice: "You need to get him in now". My husband was working and I have no family. I could do nothing for him but pray. When my husband came home we decided that we were taking him to our vet to be seen first thing. But at around 4:30am we could not find him. He always sleeps on one of his two beds in our room, never far from me. We searched the house over and then my husband found him. Skippy had gone into another room and quietly passed away. I can not explain my feelings. I had 2 seizures because of the sudden loss of my best friend. I have been ill and very sad but I know that I have to stay healthy for myself and for my family because they need me. Skippy was buried in our front yard, underneath our big cedar tree. He never wandered out of our yard and was afraid of the dark, so I wanted him close. I take flowers from the yard to him daily. I miss him terribly, but I feel like I may be ready for a new companion now. I would like another Miniature Schnauzer because Skippy was the best dog that I have ever owned. He was also a "therapeutic" dog and it always seemed that he and I were very much in tune with each other. I really am partial to Schnauzers after having had 9 beautiful years with Skippy. I enjoy coming to your website and looking at the pictures as well. It gives me so much hope that I will love again. God bless you too, Rae. If you would like to comment on Skippy's story or if you have a special Schnauzer story you would like to share with us, please fill in the Contact Max form in the left-hand column.